Many solar panels in the past have been designed to capture solar energy and make electricity out of it. 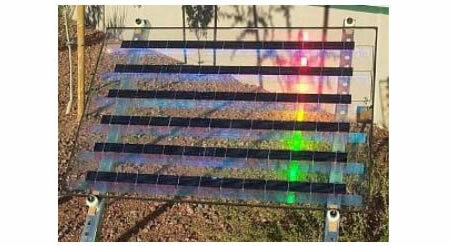 Prism Solar Technologies in Highland, New York has built this innovative holographic thin-film with crystalline photovoltaic cells that are able to capture more sunlight in regions which have low level insolation. The thin-film strips diffract both direct and reflected energy to the PV cell strips integrated between strips of thin-film. Solar modules made in this way are cheaper because they use 50-72% less silicon to make the same energy. The best aspect of this is that the modules use light from absolutely any direction including the back. The application of the Holographic Planar Concentrator™ (HPC) technology leads to reduction in the per watt costs due to less silicon, and also that it can easily capture even a low angle light.